No-one has more reasons to be glad than the followers of Jesus. Rejoicing in the Lord is not a bubbly feeling or good mood; it’s a response to what the Lord says is true. We choose to step into his constant celebration of who he is. I have no idea what the Father’s laughter sounds like, but suspect it’s unlike a chuckle and more like musical thunder. It’s the deepest, contagious expression of joy. And he draws us into that eternal laughter at his Son’s mega-triumph! Ps 2:4. Prayer is the main highway for our journey in God’s joy. When he announced his plan to be present among his ancient people, the Lord called his temple-home a house of prayer and promised that when pray-er and Presence meet, there will be JOY Is 56:7. For followers of Christ, the promise expands. The pray-er and the Present One live together in constant celebration. He shares his oil of joy with us from a realm of gladness as big as himself (which is why he calls it inexpressible and glorious 1 Pet 1:8). Rejoicing isn’t a prelude to prayer; it’s the frame in which prayer happens. In prayer sessions, joyful praise and thanks are commonly done as an opener to the main praying; a brief intro to the bigger asking. Starting with joy expressions is good, but they are meant to be on the field for the entire game, not benched after the opening few minutes. Our rejoicing honours the Lord’s celebration of what is true. Pray continually 1 Thes 5:17 is a call to a way of life. 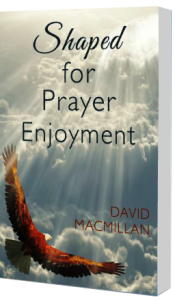 But the Spirit prefaces it with Be joyful always (v16), because participating in God’s joy is crucial to sustaining prayer as a lifestyle. The setting of Phil 4 is trouble, suffering. 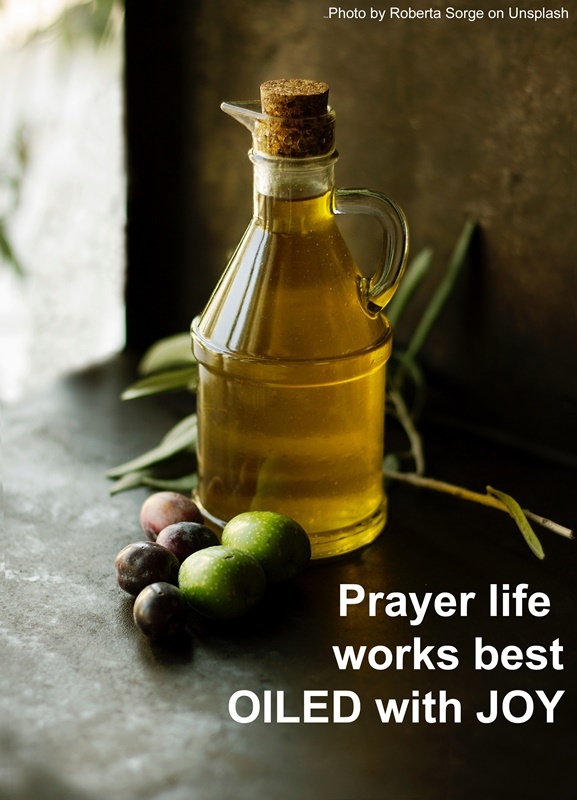 Believers are told to not be anxious but pray…with thanks (6-7). The thanksgiving picks up on the important bit that leads into the passage: Rejoice in the Lord always (v4). Learning to keep the joy and prayer connection, whatever the circumstances, is a daily growth exercise. Joy – alongside love and peace – is one of the top lifestyle witnesses of Christ Gal 5:22. Reaching for happiness is a broad thread in the tapestry of all cultures. But Jesus has oiled us with his joy so that we can pray (and live) as people who are beyond happy. Pray-ers who habitually rejoice in the Lord violate the joyless code of Darkness and exalt the nature, triumph and rule of Christ. And Easter is the perfect time to accelerate that! Focus on a place (community, nation, people group) where the church is small, weak or non-existent. Learn one thing about the people (a religious belief, cultural norm, social injustice, sin pattern, natural disaster or political crisis) that feeds fear, anxiety, misery, hopelessness. Lament, complain to the Lord about the ruin it brings. Visualize yourself present onsite (google a location pic if it helps), read 1 Peter 1:3 and join the Lord’s celebration of what his resurrection means for the birth and growth of his church there. Dance in the truth that his church will not be suppressed by that ‘one thing’ expression of Darkness, but will rise above it as witnesses who join in his celebration of the resurrection.